Black Salt, Cumin, Shajeera, Tej Patta, Tuj, Clove, Big Cardamom, Cardamom, White Pepper, Fennel, Dry Ginger, Mango, Ajwain, Nutmeg, Mace, Cytric Acid, Salt, Chilly & Mint leaves. To Serve 5 persons, grind to paste 2 cups of mint leaves, 1 cup green coriander, 8/10 green chillies, 1 big ginger and lime. Add the paste to 1½ lit. of water and salt to taste. Add 2 tbl. 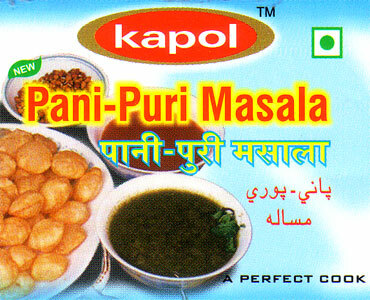 spoon KAPOL PANI - PURI MASALA and mix the mixer properly. Serve with Pungent / Tamarind Juice(Chutni), boiled potatoes, boiled black channa or moong else salted boondi as filler in the puris.